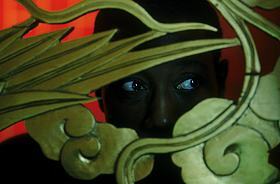 An American agent (Wesley Snipes) must uncover an international plot to bring down the United Nations on the eve of an historic summit with China. Wesley Snipes portrays Neil Shaw, who works with an elite team of covert agents so deeply classified they don't officially exist. "We're fixers," says Snipes. "We're the guys who do the things that others take all the credit." Sun Tzu's The Art of War has become the bible of business, quoted in films including Wall Street. In this film, the clue to 'who done it' is in this book, but which pithy pronouncement is the motivation? Very much in the style of its genre and era, The Art of War is set in the politics and intrigue in United Nations politics. Users of mobile (cellular) phones will find it fascinating that our heroes have clear internet access in a tunnel, but not in an office tower, usually access is not that convenient. Equally amazing is stealing a car only to find a pair of glasses that are cool, and the correct prescription. The usual espionage / crime / mystery type film. 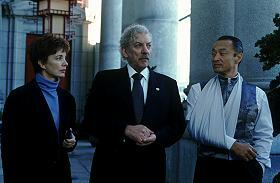 ANNE ARCHER, DONALD SUTHERLAND and CARY-HORIYUKI in Morgan Creek's, Franchise Pictures', and Amen Ra Films' international thriller "The Art of War," distributed by Warner Bros. Pictures COPYRIGHT ©2000 FILMLINE INTERNATIONAL (ART) INC. (ALL RIGHTS RESERVED). PHOTOGRAPHS TO BE USED SOLEY FOR ADVERTISING, PROMOTION, PUBLICITY OR REVIEWS OF THIS SPECIFIC MOTION PICTURE AND TO REMAIN THE PROPERTY OF THE STUDIO. NOT FOR SALE OR REDISTRIBUTION.